While on the trail lately, I have been contemplating how well my brain is at taking in and storing trail information. You might be thinking, what is trail information (TI). Since I am making this up, I will define it for you. TI is a rock with a bit of lichen on it, a fallen tree that crosses the trail, a stream, a wide open field. It is a thousand little things that are seemingly infinite in quantity that you pass by on a trail run, and somehow you remember them. I must have hundreds of miles stored away by now. It is not like I could sit down with you and describe every rock, root or log for all those miles. However, when I get back on the trail they become connected. It is like reading a book of sorts. Of course, the more you run a particular trail, the more ingrained the memories become. I think it is something that we as humans are innately good at. If you go back 500,000 years or more, if you strayed away from the campfire and got lost, you were likely going to end up being some animal’s dinner. The ability to find your way and remember all the little details was a matter of life and death. It is of course a skill that takes practice. It is also one of the reasons I love technical deep woods trail races. It is not always the fastest one that wins. It is the one who stays on the course and is able to move quickly while taking in the trail markers at the highest speed possible without missing any of the turns. I remember the first time I ran the Moreau lake 15K. I had been running on that loop with J many times that summer. In the Fall, when the race came, I was ready, and had internalized the path giving me an outsized advantage to fast runners that had not been on the trail before. I panicked slightly when I realized J and I had actually not been following the course as there was a red ribbon blocking one of the trails I had been accustomed to running down. No matter, I still found my way. More than once during that race, I had unnerved runners who had long since passed me and were now running towards me on the trail. They had missed a turn and were running backwards on the course. I calmly showed them the way and continued my race. Two years ago, T and I were looking for a 50 mile trail race to run. Somehow I stumbled on the SRT 50. T had never run a 50 mile race, and I had done the JFK 50 twice. We both signed up at the last minute, the Wednesday before the race. I figured it would be harder than the JFK 50, but that all the “slow” times in the results must be due to inexperienced runners…. I told my wife I would be home for dinner the next night and headed out with T at 2 am for the bus to the start line. We began at 6:00 am, and 16+ hours later, T and I were schooled in the way of the SRT. I did not make it home for dinner. I did not even make it home that day! It was the hardest most amazing race I had ever run. We got lost, we got dehydrated, we had hallucinations, we climbed mountains, we saw the sunrise, we saw the sunset. We were hooked! The SRT race consists of a half, 30, 50, and 70 mile race all on the SRT trail. This year since the SRT races were only three weeks after Leadville, I opted for the 30. I figured I would just go and have a good time on the trails. I managed to stay the course and my previous experience with the 50 and the 30 definitely gave me and edge with navigation. I started in the last wave of runners. I ran a pretty consistent race and don’t remember passing that many people. At the last checkpoint, I was told I was only a few minutes away from third place! I really don’t know how it happened, but I came in 3rd overall. I am going to credit part of that to not getting lost and the TI I have collected from the SRT. I figure I must have past some of the folks while they were off trail. I have deja-vu with my TI storage and retrieval abilities. It reminds me of when I was a little kid. From a very young age, I spent a large part of my free time in “the woods” at the end of the street. I would fish, catch snakes, frogs, newts, efts and various other critters. In pursuit of those critters, I would cover miles on foot. If I close my eyes, I can still see some of those streams and trails, and if I went back, I am sure I would remember them. It is kind of funny how I am really in a sense getting back to my roots with the trails. At 51, when I hit the trails with my dog, and wander around for hours on end, is it really that much different then when I was 8 years old wandering around with my childhood dog. I might be going farther and faster now, but the feeling is the same. I become that little boy and his dog lost in a great and exciting wilderness every time I head into the woods. I would encourage runners to venture into the wilderness and build some TI for yourself. 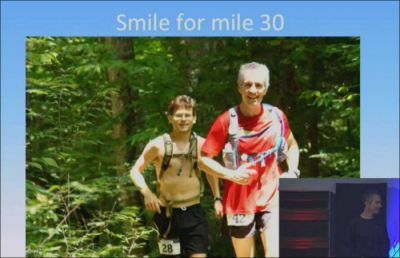 Bill is a dedicated ultra marathoner who loves running on trails in sandals or barefoot. He also hikes and does yoga. He is a professional computer scientist who is a founder of Kitware, a company that specializes in computer vision, data and analytics, high-performance computing and visualization, medical computing, and software process. To find out more about his running ethic, click on picture above for TED Talk he gave.